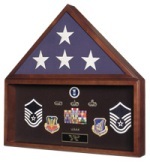 THE FLAG DISPLAY CASES IN THIS CATEGORY ARE AVAILABLE WITH A FREE FULL COLOR MILITARY EMBLEM. PLEASE SEE INDIVIDUAL ITEMS FOR MORE INFO. WE CAN ALSO MAKE CUSTOM EMBLEMS. The flag case chosen by the United States Military for the families of our fallen heroes serving in the Armed Forces. United States, Army, Navy, Air Force, Marines, Coast Guard). The case opens from the front with a hinged lid and has a hidden magnetic closure and integrated dust seal to preserve your flag. black-on-brass engraving plate. Wall mountable. Flag case and display case (one piece) to proudly display all your treasured awards and memorabilia. Solid Walnut with rich Heirloom Walnut funish. Flag case has glass front/display case has acrylic front. Price includes 1 free nameplate and solid brass service emblem. Our special flag case for display of 3'x5' ceremonial flags, as flown over the US Capitol, are available in Walnut and Oak finishes. Glass front, removable back panel with turn-button closures, wall mountable. Price includes 1 free engraved nameplate. Create a perfect display for your 3’ x 5’ ceremonial flag and accompanying certificate or medals. Ideal for storage of flags flown over the Capitol along with certificate. Glass front with turn button closures on back of both the display and flag case compartments. Available in Walnut & Oak finishes. Price includes 1 free engraved nameplate. The “Traditional” flag display case with glass front and removable back panel with turn-button closures. Made from select solid hardwoods and available in your choice of Cherry, Oak, or Heirloom Walnut. All models are wall mountable. Price includes 1 engraved nameplate & service emblem.. The “Traditional” flag display case with glass front and removable back panel with turn-button closures. Made from select solid hardwoods and available in your choice of heirloom walnut or cherry. Wall mountable. Features our medals display. Glass front, black Velcro™ insert including Velcro™ tape & instructions for easy mounting. Price includes 1 engraved nameplate & service emblem. ID: 22 1/8” x 11” x 2 5/8” for 5’ x 9 1/2’ burial flag. The choice of Presidents and Generals with choice of embossed Great Seal of the United States (standard), or no seal on elegant beveled glass. Select either Heirloom Walnut or Cherry. Features hinged lid, concealed magnetic closure and dust seal to preserve your flag. Solid wood finished back. Wall mountable. Price includes 1 free engraved nameplate & service emblem. The choice of Presidents and Generals with choice of embossed Great Seal of the United States (standard), or no seal on elegant beveled glass. Heirloom Walnut or Cherry with hinged lid, concealed magnetic closure and dust seal to preserve your flag. Solid wood finished back. Also features a solid wood pedestal stand. Wall mountable. Price includes 1 engraved nameplate & service emblem.. Flag display case with unique serpentine profile and classic solid oak. Profile looks outstanding wall mounted. Includes a glass front and Oak finished back panel. Price includes 1 engraved nameplate & service emblem. The “Memorial” flag case with a glass front and removable back panel with turn-button closures. Ideal for those concerned with affordability and simplicity. Select hardwoods with a Cherry finishe. All models are wall mountable. Price includes 1 engraved nameplate and service emblem.